This new Chrome OS-powered laptop features the Intel Core i5-5200U Broadwell processor and will hit the market next month for less than $500 USD. Acer America unveiled earlier today what they advertise as "the fastest commercial model in the industry" - the Intel Core i5-powered Acer C910 Chromebook. While the ultra low-power i5-5200U chip inside Acer's 15.6-inch Chromebook is far from today's high-end chips in terms of performance, looks like it is the most powerful processor used in a Chrome OS-driven notebook so far. This laptop was designed with durability in mind, featuring a cover that can withstand up to 132 pounds of force, while corners can handle up to 18-inch drops without damage. It is also worth mentioning that Acer C910 has the largest touchpad of all Chromebooks available on the market right now. Acer C910 Chromebook will hit the US market early next month at a suggested retail price of $499.99 USD. Acer America today sets a new milestone in the Chromebook market with the fastest commercial model in the industry – the Acer C910 Chromebook with a 5th Generation Intel Core i5 processor. (1) The Acer C910 Chromebook is part of Acer’s commercial Chromebook line and is designed for education and business customers who need extra screen real estate along with outstanding Chrome performance and a durable design. This new model will use the 5th Generation Intel Core i5-5200U Processor to deliver the fastest performance in a commercial Chromebook to date. The new model expands the Acer C910 line that uses 5th Generation Intel Core i3 and next generation Intel® Celeron™ processors(1) based on Intel 5th Generation Core micro-architecture. The new heightened performance of the Acer C910 Chromebook is the ideal complement to the other advanced capabilities of the device. Most unique is the Acer C910’s 15.6-inch display – the industry’s first of that size – which helps increase productivity by giving customers more real estate to view multiple tabs and apps. It’s also ideal for shared environments such as classrooms, labs or conference rooms. The crisp and vibrant display comes with either a full HD IPS (1920x1080 resolution) display with wide viewing angles or an HD (1366x768 resolution) display that helps meet the limited budgets of schools. Both displays feature Acer ComfyView with anti-glare properties to minimize reflection and eye strain. The Acer C910 delivers long all-day battery life of up to 8 hours, so people will be able to use it to stay productive and have fun. (4) Online connections are fast and secure with 2x2Wifi 802.11AC with MIMO technology. (5) It also has two full-sized upward facing speakers for greater volume and clarity. Customers can connect other peripherals to it via Bluetooth 4.0, the USB 3.0 port, USB 2.0 port and HDMI port, as well as read SD cards to access and transfer files. The Acer C910 weighs only 2.2kg (4.85 pounds) and measures only 393w x 256d x 24.2h mm (15.4w x 10.08d x 0.95h inches). The Acer C910 is ideal for people who view, edit, create and collaborate both online and offline in programs, such as Office documents and Gmail. Chromebooks are simple to use and can be easily shared by multiple users. Storage on Google Drive(6)protects files, documents, and photos safely in the cloud, and ensures that the most current version of the file or document is always available and safe, even if the Chromebook is lost or stolen. Security is a key benefit of Chromebooks, as they are automatically updated to guard against ever-changing online threats. In addition, the Supervised Users feature helps get children online in a safe, controlled way. 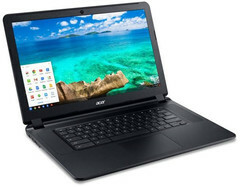 The Acer C910 Chromebook C910-54M1 has a 5th Generation Intel Core i5-5200U processor, 4GB of DDR low voltage memory, 32GB SSD storage(7) and a 15.6-inch Full HD display. It will be offered in the U.S. beginning in April at a manufacturer’s suggested retail price of $499.99. Exact specifications, prices and availability of other models will vary by region. Established in 1976, Acer is a hardware + software + services company dedicated to the research, design, marketing, sale, and support of innovative products that enhance people's lives. Acer's product offerings include PCs, displays, projectors, servers, tablets, smartphones, and wearables. The company is also developing cloud solutions to bring together the Internet of Things. Acer employs 7,000 people and ranks No. 4 for total PCs globally. (8) Estimated revenue for 2014 is more than US$10 billion. Please visit www.acer.com for more information. Q3 2014, Gartner data, worldwide markets. The touchpad dimension of Acer Chromebook 13 is used in the size comparison of 13.3” vs.15.6” Chromebooks. Specifications vary depending on model. Battery life may vary depending on usage. Actual battery life varies depending on product specifications, computer settings and applications or features launched. Battery life may vary depending on model and configuration. Based on Google power_LoadTest. All batteries’ maximum capacity diminishes with time and use. Based on IEEE 802.11ac draft specifications. Actual speed will vary depending on network conditions and environmental factors, including volume of network traffic and density of surrounding structures like walls. An 802.11ac wireless equipped PC requires an 802.11ac router to work properly.